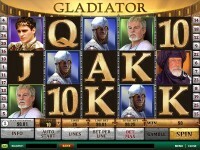 Gladiator is a 5-reel Playtech slot based on the hit 2000 movie. This slot features 25 paylines, wild symbols on the middle 3 reels, free spins, and a bonus feature. 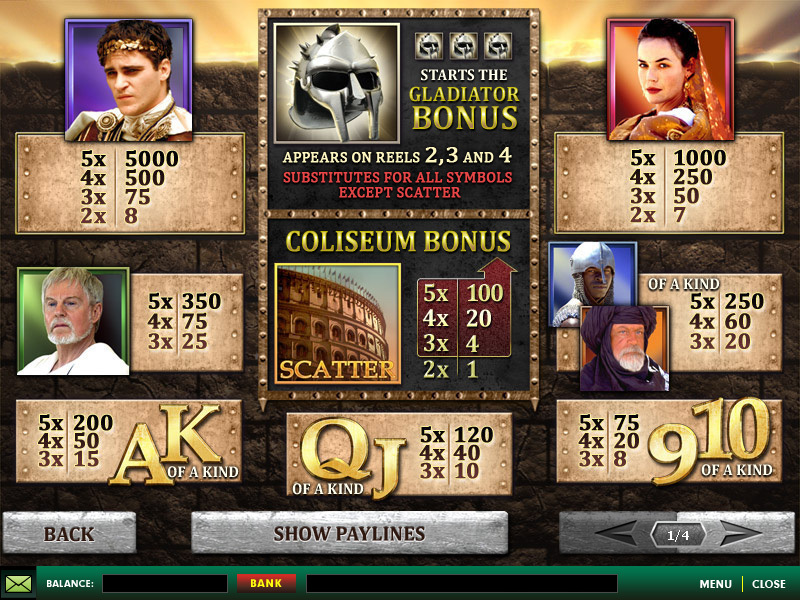 The Coliseum Bonus is triggered when three or more scatters land on the reels during a spin. You are taken to a screen with four rows of five stones and you choose one from each row. The first row is the number of free spins you will get, the second row awards multipliers for those free spins, the third row gives you an extra scatter symbol, and the fourth row awards an extra wild symbol. The extra scatter wins pay out based on the paytable for the chosen symbol. With each pick you will win the prize, plus you get one of four options. You can either collect all the prizes in the chosen column, pick another prize in the row above, pick another prize in the same row, or collect the prizes and continue to free spins. 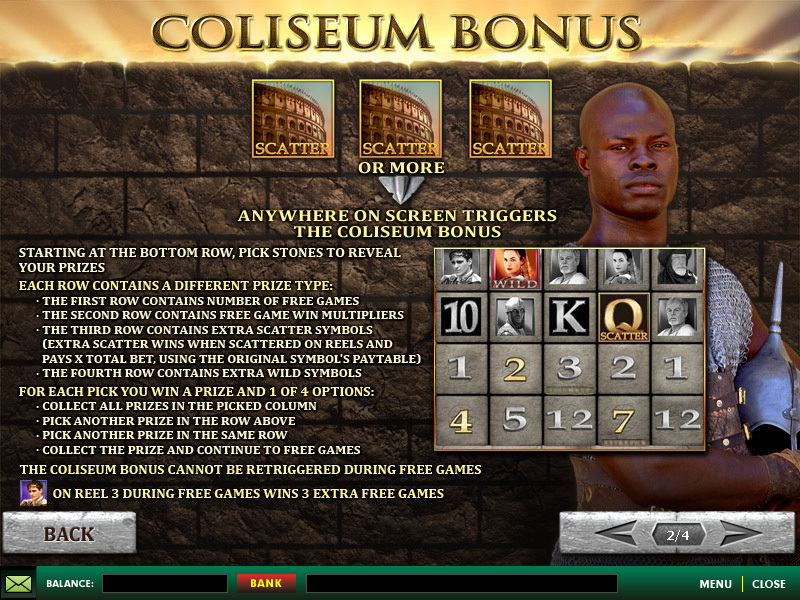 The Coliseum Bonus cannot be re-triggered during free spins, and if the highest paying symbol lands on the third reel, you are awarded 3 extra free spins. The Gladiator Bonus is triggered when three wild symbols land on the middle three reels. The middle reels then fill up with randomly selected helmets with different prize values. You can get gold, silver, and/or bronze helmets, and prize values follow the obvious order. This is another one of those slots with scenes from the movie embedded in the symbols and other areas of the game. I have to say I enjoy playing these types of slots, and this one is well done. 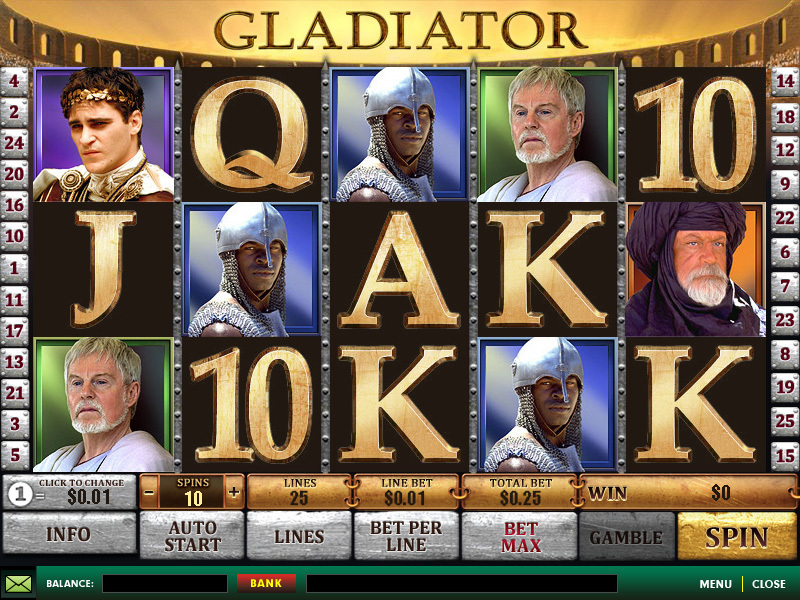 Play Gladiator today at any of these Playtech Casinos.